We are, Warren and Maggie and we like to welcome all our guests personally, ensuring that your time with us is stress free and relaxing. 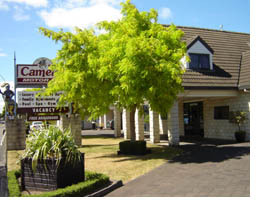 We have been moteliers for six years, four of which have been here at Camelot. Our aim is to create a comfortable motel that offers you a peaceful nights sleep and a place to relax. All our rooms are non-smoking and the ‘out of room’ facilities such as private indoor spa, a solar heated pool, gym and laundry facilities are available to all guests. We are very happy that many of our customers come and stay with us time and again and become our friends. We are handy for the Rugby & Cricket Stadiums, the CBD and Frankton & Te Rapa Industrial areas. If you are arranging a group to stay please call or email. We have several multi bedroom units that allow you to all stay together, without having to go from room to room (or motel to motel). Our rooms are as comfortable as any hotel room in our price range. If you need help or advice abut where to eat or what to do when you are here in Hamilton please come to the reception and ask. We are here to help.